"This book is a rarity in the scholarly world in that it is both rigorous in its scholarship and speaks with knowledge and passion about an exciting subject that demands our attention. We have here perhaps the best book ever written on miracles in this or any age. Highly recommended." Most modern prejudice against biblical miracle reports depends on David Hume's argument that uniform human experience precludes miracles. Yet current research shows that human experience is far from uniform. In fact, hundreds of millions of people today claim to have experienced miracles. Respected New Testament scholar Craig Keener argues that it is time to rethink Hume's argument in light of the contemporary evidence available to us. This wide-ranging and meticulously researched two-volume study presents the most thorough current defense of the credibility of the miracle reports in the Gospels and Acts. Drawing on claims from a range of global cultures and taking a multidisciplinary approach to the topic, Keener suggests that many miracle accounts throughout history and from contemporary times are best explained as genuine divine acts, lending credence to the biblical miracle reports. "Any history of the rise and growth of Christianity that fails to take account of the belief in miracles and healings and signs and wonders is missing a very large part of the story. That statement is truer than ever today when we look at the booming churches of Africa and Asia. Craig Keener's Miracles is thus a major contribution to understanding the Christian faith, past and present. The book is all the more valuable because of Keener's thoughtful and bold analysis of the scientific method and the means by which we can test the miraculous. This massively researched study is both learned and provocative." "Seldom does a book take one's breath away, but Keener's magisterial Miracles is such a book. It is an extremely sophisticated, completely thorough treatment of its subject matter, and, in my opinion, it is now the best text available on the topic. The uniqueness of Keener's treatment lies in his location of the biblical miracles in the trajectory of ongoing, documented miracles in the name of Jesus and his kingdom throughout church history, up to and including the present. From now on, no one who deals with the credibility of biblical miracles can do so responsibly without interacting with this book." - J. P. Moreland, distinguished professor of philosophy, Talbot School of Theology, Biola University. "This is vintage Keener--exhaustive research, expert command of and thoughtful interaction with both ancient and modern sources, impeccable analyses of all sides of the argument, and deft handling of the controversial issues--plus some! It will be a long time before those skeptical about miracles will even begin to mount a response to what will undoubtedly henceforth be the first stop for all serious researchers on this topic." 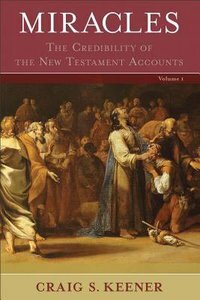 "Craig Keener's discussion of New Testament miracles adduces a uniquely--indeed staggeringly--extensive collection of comparative material. That eyewitnesses frequently testify to miraculous healings and other 'extranormal' events is demonstrated beyond doubt. Keener mounts a very strong challenge to the methodological skepticism about the miraculous to which so many New Testament scholars are still committed. It turns out to be an ethnocentric prejudice of modern Western intellectuals. So who's afraid of David Hume now?" About "Miracles: The Credibility of the New Testament Accounts (2 Volumes)"
part 2: Are Miracles Possible? 4. Antisupernaturalism As An Authenticity Criterion?